It is no longer a secret that social media channels are used for assisting customers on a daily basis. Customers tend to ask questions and resolve their issues publicly. In fact, 90% of consumers surveyed by Social Sprout have used social media in some way to communicate with a brand. Over a third (34.5 %) said they preferred social media to traditional channels like phone and email. If your customers contact you on social media, they expect prompt replies. According to research put out by Lithium Technologies, more than 70% of users expect to hear back from the brand they’re interacting with on Twitter, and 53% would like to get a response within an hour. Other researches reveal that 42% of customers who complain on social media expect a response within one hour and a lack of response could result in up to 15% customer churn. Only 2% of customers who were given an email address or telephone number on social asked for it in the first place. Other customers may feel frustrated and disappointed with the service after being transferred. Providing personalized support is possible on social media. If you do not wish to resolve the issue publicly, you can always switch to private messaging and solve the problem right away, without involving other communication channels. It’s hard to provide customer service on social media if you don’t have a way of monitoring when your brand is mentioned. However, there are lots of various tools that allow monitoring your brand mentions. 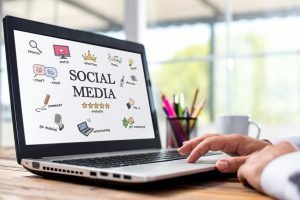 Besides relying on third party tools, you need to monitor your social media profiles and respond to all comments no matter whether they are positive or negative. Additionally, while customizing your brand mentions monitoring settings you need to take into account that your brand name may be misspelled and adjust your settings accordingly. The main goal of personalized experience is creating the personal touch. It’s not just mentioning your customer by name. If you really want to create the personal touch you need to go the extra mile. Social media gives you access to tons of data about your customers. Just take advantage of what your customers say and do on Twitter or Facebook and use this information while communicating with them. No doubt, they will be pleasantly surprised and will share their positive experience. As a matter of fact, almost all customers who have been loyal to your company expect something extra. This can be additional discount, bonus or a birthday greeting card. On social media you can do even more – mention your customers’ business pages or share their posts. This will not take much time and effort but will bring positive feedback. On the other hand, you need to be careful while mentioning somebody or sharing someone’s content as this may be perceived as promotion or giving preferences to some companies over others. While posting reviews on your social media pages your customers fall into two camps: they share positive experience or give a negative feedback. Good and bad news shared publicly may make or break your brand. Thus it is important to be careful while responding to any type of feedback, even if this is a complaint. According to New Voice Media a third of customers post online following inadequate customer service, sharing comments about your brand to their network and beyond. At the same time 52% of customers expect to hear back from brands within 7 days of giving an online review, particularly one that’s negative or critical. This shows the significance of handling any type of negative reviews posted on social media channels. Responding to negative reviews is one of the easiest ways to engage with your critics, learn from the customer first-hand, and showcase goodwill with your vocal customer base. In fact, this is just the best way to show that you hear the voice of your customers. Leaving a negative feedback unanswered and hoping the issue will blow over is the fastest way to ruin your company’s reputation. On the other hand, if you respond and show that you are doing your best to solve the issue, your customers and prospects will see that you care. Thank you fro your feedback. We are sorry to hear about your bad experience. This is definitely not the standard of the service our customers have come to expect from us. Our main priority is to keep our customers happy and provide excellent customer service. Please contact us, as we would like to make up for your disappointment. [Add here information about contact channel and your name and position in the company if you would like to handle this personally]. No matter how fantastic your brand is, mistakes happen. And thus customers feel upset and start complaining. The main secret of social media customer support is to monitor and respond to any type of feedback, showing your customers that you are here to help them and to solve any type of issues they have faced. This entry was posted in Articles and tagged customer support, social media, social media customer support. Bookmark the permalink. Olga, i started to work hard in the social networks of my products, I hired a person to remain exclsuiva for customer service. Result? My sales have increased and a lot in social networks. That’s right. If you invest in social media customer support, this will definitely pay off and increase your sales. Thanks for sharing such an insightful write up! This will really help out with our social media management. We hope to use these tips and see our brand grow. Looking forward to more content like this. Thank you for your comment, Henry. I am glad you enjoyed our article. Thanks for sharing,That’s right. If you invest in social media customer support, this will definitely pay off and increase your sales. Great tips Olga. I started using social networking on one of my products and had an absurd sales increase. Really social networks have overwhelming power! Thank you for your comment, Daniella. I am glad you found my social media customer service tips useful. You reveal an excellent content, and of course, we should respond to the negative feedback. I very much agree with you on the part that says about empathy, it really is one thing that makes all the difference. Thanks Olga for your sharing. Your points are really impressive. I think Social Media’s customer service is a complex mix of having the right tools run by the right team. Social Media customer service is a perfect solution for B2C businesses. Kindly share some tips on how I can use customer support service for B2B companies? Thank you for reading my article, Dhrubo. Let me refer you to one of posts in our blog. I hope it will help you to find answers to your questions. Very Nice post,you have mentioned very crucial points on customer support, specially this point “Your customers are humans, so use the right tone of voice”,these ideas will helps a lot.Thank you.